When Booksneeze offered the possibility to review this latest book of Andy Andrews I immediately acccepted. I very much enjoyed The Heart mender which I also reviewed here. The 11th of April (posting schedule) came and went and I will first tell you, this is one book not to be rushed. Andy Andrews has this particular knack for involving the reader body and soul in his books! 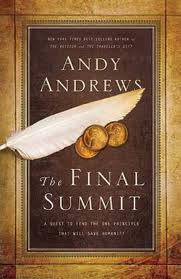 The Final Summit was a hard one to put down and I was not disappointed: I very much enjoyed reading it! "Many years have passed since David Ponder discovered the Seven Decisions during a divine journey through time. Now 74 years old, Ponder has lost the one thing that mattered to him most—his wife, Ellen. Despite his personal and professional success, he now sits alone at the top of his 55-story high-rise contemplating the unthinkable, just as he did 28 years ago. However, just as things are looking their darkest, Ponder is informed through divine channels that he is needed now more than ever. This is mankind’s last chance. Millennia of avarice, pride, and hate have sent humanity hurtling toward inevitable disaster, and far from its original purpose. There is only one solution that can reset the compass and right the ship—and it is only two words. Ponder, along with a cast of famous historical figures, must work quickly to discover this solution. The fate of the world rests on their shoulders." This is a book I recommend you read slowly and ponder upon. Andy Andrews's faith and knowledge of History, his very definition of human tendency's to ignore certain signs and rewrite this history to make it easier to understand will make you think again upon what you thought you knew about our world! "What does humanity need to do, individually and collectively, to restore itself to the pathway toward successful civilization?" But I will tell you however my favourite...From Union Colonel Joshua Chamberlain who hastily wrote the words, "I am a person of action" on a scrap of paper. Clearly, this is a book you must "experience" and Andy Andrews has woven a well written story that will leave you indeed pondering. Each chapter will inspire you to involve yourself and add your name to the "personal declaration"! Finally I will recommend heartily the Author's notes and the reader's guide to help you of course to discover even more about other Travellers...Who knew? I give this one 5 stars! I received this book free from Booksneeze as part of their Blogger Review program. I was not asked to write a positive review and the opinions expressed are entirely my own. I am disclosing this in accordance with the FTC 16 CFR, Part 255: “Guides concerning the Use of Endorsements and Testimonials in Advertising.